Everybody knows at least one person who has been diagnosed with one or more mental disorders. Mental disorders are very common in children, adolescents and adults. A lot of people can live with their mental disorder without experiencing too many problems. But the majority of the people suffer from the symptoms of their mental disorder. If left untreated, mental disorders can affect life at work, at home, and during daily activities. Someone who has been diagnosed with agoraphobia, for instance, may not go to birthday parties. A person diagnosed with borderline personality disorder may have trouble maintaining long term relationships or friendships. There are many other ways in which someone’s life could be affected by mental disorders. Most likely your life is also affected by someone who has been diagnosed with a mental disorder. If you want to schedule a first, free of charge, session, contact us. List of Trauma and Stressor-Related disorders. A mental disorder is a mental or behavioral pattern or anomaly that causes suffering or an impaired ability to function in daily life. This pattern or anomaly is not developmentally or socially normative. Mental disorders are a combination of how someone thinks, behaves, feels and perceives. Often mental disorders have a social aspect and are associated with certain brain functions, or areas in the brains or elsewhere in the nerve system. There are different reasons that can (partially) explain why and how mental disorders develop or are triggered. Sometimes damage to the brains can be an explanation, sometimes a change in hormones. Traumatic events (car accident, loss of a loved one, physical or emotional abuse) are associated with mental disorders as well. These traumatic events could date from childhood. Children who were bullied in elementary school may develop self-esteem issues and perhaps even a personality disorder or anxiety disorder. A nasty experience with a spider may develop into a post traumatic stress disorder and perhaps into a spider-phobia as well. 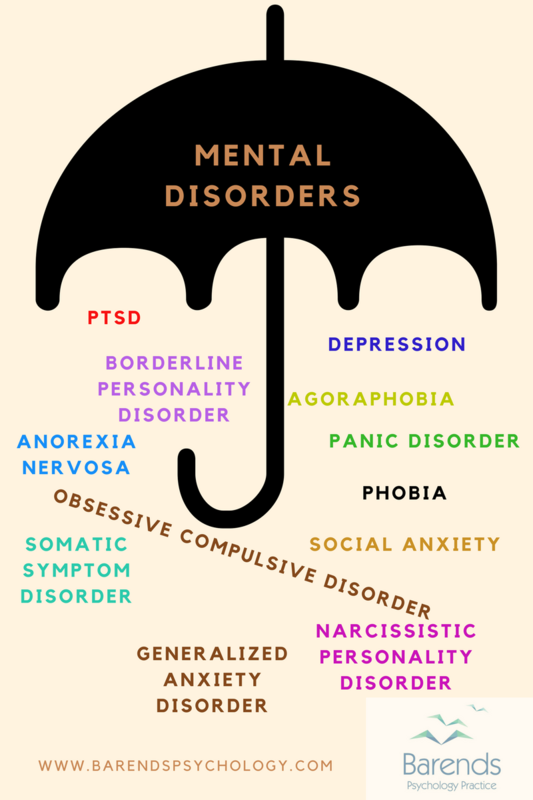 In short, mental disorders can develop and be triggered in various ways. Mental disorders do not arise from one day to another. Often there are already indications in an early stage that hints towards the development of a mental disorder. Quickly checking all the lights in the house before going to bed may slowly develop into a thirty minutes taking ritual every time you leave the house or go to bed. Someone who dislikes being at parties, may start avoiding them and over time slowly avoid other social activities. In a few years this person could be locked up at home without seeing anyone for weeks. 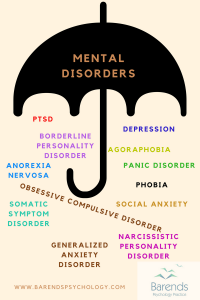 There are various types of mental disorders and every one of them has it’s own developmental history, it’s own way of affecting the person and it’s own treatment. Information about the most common disorders you can find here. At Barends Psychology Practice, online therapy sessions are being offered for all the below mentioned mental disorders. At the bottom of the page you will also find a link to a page about the interaction between caffeine disorders. This might be handy for some people. Bipolar disorder (Bipolar I, Bipolar II, Bipolar disorder Not Otherwise Specified). Seasonal affective disorder (winter depression, summer depression). Agoraphobia (e.g. fear of public places). Specific phobias (e.g. spider phobia). Uncommon sexual disorders in men.